Will Toronto invest in its future? A close reading of the top bureaucrat's state of the city address. Wallace’s speech was a glimpse into the crystal ball of council’s future, but its fortunes were unclear. Photo courtesy of Dave Bremner via the Torontoist Flickr Pool. City manager Peter Wallace delivered his third annual state of the city address yesterday at the Munk Centre. His speech, titled “Investing in Toronto’s Future,” was aimed squarely at the council yet to come, the crew who will be elected for the 2018-2022 term. With the public launch of the annual budget cycle only weeks away, this talk can provide a glimpse into the murky crystal ball of City finances. Wallace argued that numbers and trends matter, although his speech included fewer details than we have seen in past addresses. The new council’s challenge will be to close the gap between the vision and promises of the current administration and the resources available to deliver them. Although the city has a good financial base, its government does not have the resources it needs to deliver on the strategies council has endorsed. Three areas stood out for Wallace: the dual challenges of congestion and transit, public housing, and child poverty. Wallace said almost nothing about transit plans, a wise stance considering financial pressures and controversy inherent in plans such as the Scarborough Subway Extension, SmartTrack, and the Relief Subway Line. Nor did he talk of the crumbling inventory of Toronto Housing buildings, another civic asset crying out for investment. Despite the city’s wealth, one in five Toronto children live in poverty compared to the provincial average of one in 10. Wallace is appalled by these numbers, and the situation within Toronto is especially dire. However, little of his talk actually addressed how this might be changed or the broader implications of focused spending on this rather than other parts of the budget. The City has many grand policies, but the key issue is affordability. Annual spending is limited by indexing residential property taxes to inflation, but thanks to ongoing relative reductions in commercial taxation, property taxes overall have grown more slowly over many years. 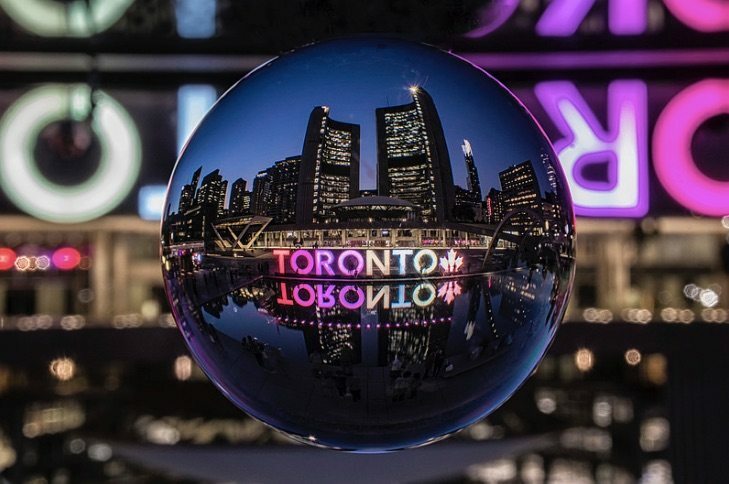 The question faced by present and future councils is simple: can Toronto reach the goals, the dreams embodied in policy announcements and decisions? If anything, “investment” is a topic Toronto council does little about. Talk of the city’s bright future is clouded by the political mantra of holding down taxes and by annual debates over every small saving or added cost at the margin. There may be great capacity in the growing city, but how can this be translated to real improvement in the services it delivers? Wallace takes pride that the cost of City services per capita, adjusted for inflation, has changed little over seven years, and the City government spending is actually falling as a percentage of the local economy (GDP). This may play well for a manager working under mayors whose primary concern is electoral, of playing to populist slogans of government waste and the City Hall gravy train, but it hides the effects on service delivery. Looked at on average, City spending trends might be laudable, but averages hide situations where improved spending in some areas is achieved by pillaging other budgets. Total dollars spent tell us nothing about the quality of service provided. Later in his speech, Wallace cited the licensing and standards division whose staffing has fallen by about 20 per cent, even as new demands such as regulation of sharing services are added to their mandate. The City manager argues that there is “absolutely no justification” for saying that spending is out of control and the city is not affordable. These are really two separate issues. There is an important distinction between property taxes (and what they fund), and the broader set of costs facing Torontonians. Included in these are municipal services with their own dedicated revenues (water, waste management, and many fee-based programs), not to mention the basic cost of living and operating businesses in the city. Those separate funding streams bring their own budget challenges because programs depending on the base budget must compete for the limited dollars available. There is no dedicated social benefit tax, and these programs are squeezed disproportionately by council spending priorities. Wallace cited a City-approved replacement for Seaton House, a building he described as “unsafe,” that provides critical services to the poor in downtown Toronto. There is a beautiful new design, but no money to build it. Among the few charts and numbers Wallace did present was an illustration of the rate of growth of various City revenue streams. Stated on a percentage basis, the Municipal Land Transfer Tax stands out thanks both to the strong real estate market and increases in the basic rates. This growth has always exceeded budget expectations, but the money has gone to hold down taxes while underinvestment, notably in transit, leads to a backlog of deferred costs. Wallace argues that there is a limit to “squeeze strategies,” of making do simply by trimming budgets. He may think that, but weaning council from expecting that there is always more fat to cut will be a hard task. Indeed he undercuts his position with a pride in continuing attempts to limit costs even though the amount of available savings dwindles each year, and this tactic will not cover the budget shortfall. With a new council in the fall of 2018, Wallace hopes to get the direction and investments the City needs. This is an optimistic view of the city’s political future, and there is no guarantee that council’s past eight years of avoiding hard budget decisions will change. A: Decrease service levels to fit available tax room and focus on traditional services to property. If the City wants to maintain incremental tax cuts, it needs to “step away” from some programs. B: Maintain existing service levels. This will require additional revenue, and only limited expansion will be possible. C: Broader city building. More dollars will be needed to maintain existing services, pay down deferred costs, and fund approved strategies, plans, and commitments. The City manager was quite clear: we cannot deliver option “C” programs with option “A” revenues, and council must provide direction on which path the City will take. At this point, the talk turned to potential solutions and took on a decidedly managerial bent—better information to support decisions, value for money, fair and effective budget reviews, multiyear budgets, evidence-based priorities. These nostrums roll out quite regularly, but they are meaningless without context. What are the City’s goals? Which evidence matters in the political sense? What problems will be ignored? What is the yardstick for fairness? The City is a long way from a “data driven system” and investment in management is required, Wallace argued. This implies that somehow if only there were better data, council would make better decisions. Oddly though, he also noted that money is going into technology solutions, not business solutions. This implies that too much emphasis has been placed on the magic of large-scale business tools without enough attention to how the City’s business actually operates. Wallace compared the growth in spending for the City’s divisions (such as transportation; parks, forestry and recreation) at 26 per cent versus with a 40 per cent level at agencies, the largest of which is the TTC. This implies that there are more savings to be found in the agencies, but does not address what is driving growth in their costs. While cuts to licensing inspectors might be absorbed into workload and service levels, cuts to transit affect people in ways that riders will not tolerate. Moreover, transit is subject to costs that do not respond to mayoral dictates on belt-tightening, notably the extra millions for opening the subway extension to Vaughan. The City manager argued that some user fee structures work against City policies such as TTC fares at a level where increases could drive away riders, but parking that is underpriced and works against transit by making driving cheaper. This is a fine idea in theory, but try telling that to a council and mayor for whom cheap, plentiful parking is sacrosanct. Other potential savings might be achieved by reviewing the roughly half-billion dollars in foregone tax revenue through various subsidies such as tax holidays for businesses. Some of these are under study, but Wallace gave no indication of how seriously, or which areas might yield the greatest savings with the least impact on City policies. Wallace argued indirectly for increased support from the provincial and federal governments in recognition of Toronto’s regional and national role. Ninety per cent of the GTA’s public housing is in Toronto, and 37 per cent of provincial social housing is here. Sixty per cent of all transit riding in Ontario is on the TTC. However, these statistics have to be seen in the context of lower spending on social programs elsewhere in Ontario and could be used to argue that greater subsidies should flow to other communities. Spending more on Toronto is a challenge for any politician beyond the city boundary. Even while calling for more support, Wallace claimed that Ontario has been “quite generous” with gas tax. That really is a case of cherry picking because monies flow to the City from a variety of sources and downloading costs to the City remains a challenge. He noted that there is an artificial distinction between responsibilities for provincial and City program delivery, not to mention the expectation that Toronto would deliver services to support goals of other governments. Blaming the other guy is a long political tradition, but without a better accounting of overall needs and a philosophy behind how their funding should be shared, this rings a bit hollow. At the end of the session, Wallace was asked what pointers he would give to his successor when that day arrives. He replied that those who manage the City should recognize their privilege and perspective, but not substitute themselves for the political leadership. The civic bureaucracy provides advice and has enormous resources at its disposal. The challenge is to find an “ethical orientation” to that advice, to allocation of fiscal resources, and to working with colleagues. Most in the audience hoped for a preview of the budget to come, an advance warning of the hot topics where the mayor’s election hopes will run headlong into the realities of City finances. Wallace chose instead to skip over 2018 and dream of what he might achieve with a new council. For the coming year, the crystal ball is completely dark.